Leaving on Saturday at midday seemed like a good idea. The past few days of problems were behind me ( flat battery, rudder problems, gas cannisters not fitting, mobile search light not working and seat pad not fitting etc ) or so I hoped. A large crowd gathered to watch my departure and chear me away. After 3 hours rowing a half hour for drinks then another 3 hours before food. By 11.00pm the light from the Harbour was sinking away into the distance, 3 hours sleep then another row. 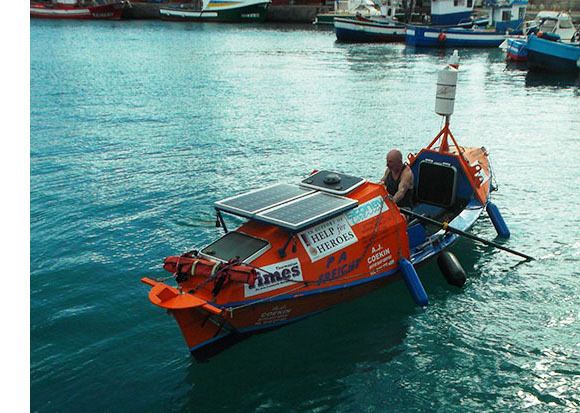 The wind blew up in the early hours of Sunday and as soon as I stopped rowing the boat immediately turned beam on so it was time to set the sea anchor for a few more hours sleep and by 8.00am the wind had dropped so it was in with the sea anchor. As the conditions weren't to bad during the early hours I had set the sea anchor with rope that was available on deck plus the smaller ropes as tripping lines to pull the anchor in. Without thinking I put the recovered sea anchor and line on the fore deck ready for putting away later so I could start rowing immediately. By 1.00 pm the wind had increased again only this time to 25 knts, by 2.00pm it had risen to 30 knts and it was time to get the sea anchor back in. This was my first mistake, not changing the ropes to stronger ones. At 3.00pm I decided to get the snubber out, three minutes later a large wave curled over the gunnels and put an end to my hot food. As I remember this was the start of the manual pumping as the cockpit was now half full of water. Unfortunately it was at this time the main float operated pump failed forcing me to deploy the emergency pump that can only be controlled by switching it on and off manually for 10 min every half hour. This meant no sleep until the storm was over. I had anticipated the Khaggavisanna in heavy seas and knew she was low in the water so I had fitted a deck pump with a float switch which I could leave on all the time but the sea swell had made it useless, the water just cascaded over the side and around the cockpit. About 7.00 am Monday I realised things were getting desperate as it was now taking 15 min to clear the cockpit every few minutes, I realised the sea anchor had parted when the boat broached and I had been rolled over by a huge wave, I expected her to come upright but she stayed on her side and I knew it was time to leave. As I got into the liferaft I was heartbroken. Arriving back home, I sat down and went through all the things that contributed towards the disaster. I had on my mind before starting the journey certain worries, one of them and probably the most serious occured on the first sea trials. I had driven the boat and trailer down to Shotley marina on the east coast to what seamed the perfect spot to test the boat. Situated at the junction of two rivers the Stour and Owell, plenty of sheltered water or so I thought. My plan was to row out of Harwich port into the open sea. Arriving late in the day, as it was completely windless and calm, I decided to launch and row around to the marina and leave the boat alongside the entrance jetty. At 10.00 pm I received an urgent call from the Lock Keeper telling me the boat was sinking. In my absence the wind had picked up blowing staight in toward the jetty, the sea had become choppy and the boat had became trapped, tilted and taken in an enormous quantity of water. This demonstrated to me that the boat was very low in the water and the rubber flaps to the side of the sloping decks I had fitted which were supposed to drain out, were instead allowing water in. When I first aquired the Khaggavisanna she was an open boat with no structure above the gunnel. I had decided to fit fore and aft cabins in 12mm ply in keeping with the tried and tested design of my first boat "The George Geary" in which I had made three succesful crossings. This not only added additional weight but also changed the centre of gravity. I had fitted two pumps the main being float operated was in the bilge, in the event this failed me at the worst possible time, the second pump also float operated was on the side decking and was ineffective due the violent rolling. The only thing for it I have decided is to use my original boat next year. At least that is only 20 years old not 48. Following Sundays phone call the situation rapidly deteriated for Graham, the winds continued unabated and the seas built up causing the boat to be constantly awash. Eventually Graham deployed the sea anchor and closed himself into the aft cabin and and tried to ride it out. Unfortunately in the increasing wind and sea state the line to the sea anchor parted the boat broached and began to be rolled down the face of the mountainous seas and took on more water and began to sink. Graham broke out the liferaft grabbed some essentials and jumped in. After an emergency call to Falmouth rescue center a Spanish helicopter was despatched and Graham was rescued. Grahams own account will follow in a few days. Sun 18.57. A worrying call from Graham, he's been in 35kn winds since 12.00 and shipping water badly. He's hopeing the winds will moderate before to much longer. Latest departure date Saturday 17th 10am. Battery problems resolved, good weather window. This should be it. Bon Voyage Graham. 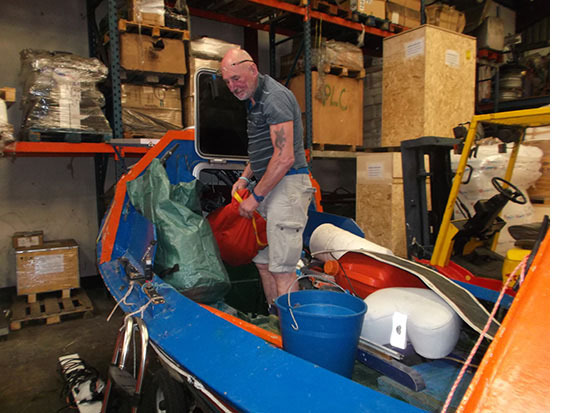 The boat was shipped back to UK following the aborted 2016 attempt. Once home the bottom was cleaned up and completely sheathed in fibre glass to deal with the leaks. Then modifications were carried out to improve stability. Finally sea trials were carried out at Shotley in December 2016 which highlighted the need for further modifications which were carried out. 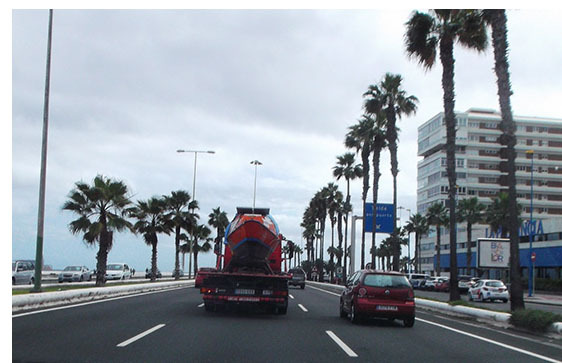 The boat was shipped out and a arrived in Las Palmas Gran Canarey on Feb 3rd, Graham and I flew out on Feb 6th ready to start work. Unfortunately customs clearance was a long drawn out affair and we were not able to get our hands on the boat until the Fri 10th, even then the lorry we had arranged to transport the boat from Las Palmas to Mogan harbour was unable to get through until late in the day as it was market day in Mogan. Finally Sat 11th we were able to start work getting the boat stocked and prepared for the trip then finally on Sun 12th she was launched and in the water under the close scutiny of a large group of curious holiday makers. The planned departure was Wed 10th but that had to be put back due to battery problems and is now scheduled for Thurs or Friday. 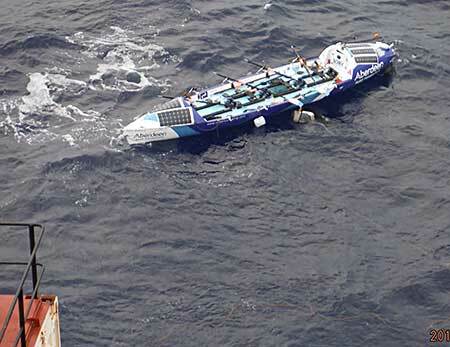 It has not been easy to gather my feelings and put pen to paper and tell of the tragedy that happened whilst we attempted to break the world record for the Fastest Row across the Atlantic. If my original plan had worked I would not have become involved with the record attempt. Needing some help to get the The Khaggavisanna home for major repairs I had rang Simon knowing he was about to haul empty trailers back to the UK. Unknown to me one of his team had dropped out of his record attempt at the last minute. How could I refuse when he asked me to take his place? 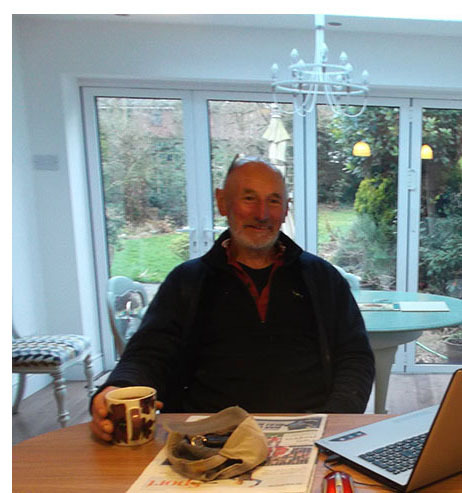 I knew it would be tough rowing 12 hours a day in 4, 2.5 and 1 hours sessions, fortunately Simon was well aware of the stresses and strains the body must take especially a 68 year old one. The longest period was during the night so that off duty crew could sleep. A 3 minute break every hour taken seperately gave us a chance to eat, drink and go to the toilet (on a bucket at the rowing station) or use a pee bottle, not to mention washing etc. Our main meals were taken after we came of watch, freeze dried with boiling water added plus a day pack of chocolate bars, small bags of sweets, jelly babies and pork scratchings etc. After 3 days half of my watch were having to row with bare backsides due to sea water boils, a very painful condition. Dolores my cabin partner and myself were able to escape this affliction. By the 18th day at sea our bodies were becoming used to the sea conditions, sleeping on a thin matt and being rolled about. Dolores slept in the coffin birth which is about 20 inches wide and 6.5ft long down the center of the boat forming a human keel. On February 14th as the wind had been strong for many days we were on course to break the record, but little did we know that night would bring many horrors. At 6.30pm our watch took over rowing, which was very difficult as the wind had risen to 35knts, then continued to 40knts and more. Rowing had become impossible as the wind tried to blow the oars straight out of our hands. Holding them hard we must have been blown along at 5knts. 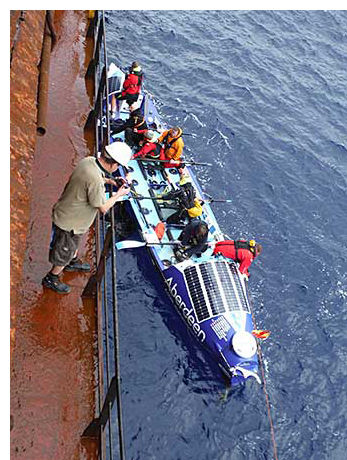 As our watch came to an end the wind had slackened to 30knts and rowing had been resumed. About 30mins into the next watch we heard the shout MAN OVERBOARD. I immediately came out of the cabin followed by Dolores, Simon called me over. I knew before he shouted instructions it was vital to slow the boat down, also noting it was Mike who was missing. Simon deployed the sea anchors whilst I arranged the drogue which had about 20 meters of rope on it, attatching it to the rowing riggers. Simon had already hit the man overboard button which immediately gives a position then asked me to deploy everything that could be attatched to ropes giving me a full coil of rope. Simon then got on the VHF sending out mayday calls. I began gathering items to go over the side, buckets and jackets tied together, cabin matts. Murray stood high on the aft cabin with the brightest lamp shouting all the time over and over saying he could see Mikes head torch, we all managed to get a glimpse of it but a very long way from the boat. Falmouth rescue center had taken up the response after we had hit the EPIRB and Simon began to explain the wind direction and sea conditions. Everybody was still trying to slow the boat by keeping the oars in the water, Simon threw over the liferaft attatched to a long line. I started to fill the ballest tanks. Three or four hours had ellapsed since the start of the emergency when as I was filling the last of the ballast tanks a large wave crashed over the boat knocking me over with a large crack from my knee. Still hoping I could help I grabbed one of the oars for Dolorese, shortly afterwards I began to shake, soaking wet through hypothermia had taken over. The frieghter arrived about 10am the next morning, the captain spoke to Simon on the radio saying he would do a search pattern until 2 hrs before sun down at which point he would return to take us aboard. The aircraft had also appeared and was beginning its own search. All other shipping in the vicinity joined in the search but sadly Mike was never spotted and as the daylight faded the search was abandoned. 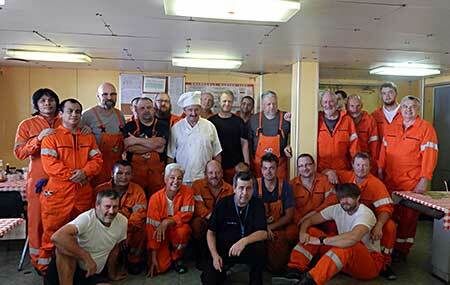 The freighter a Polish vessel named Sea Pearl returned and picked us up, the Toby Wallace was abandoned. We were dropped of 8 days later at the next port of call in Brazil and from there arranged flights home. During the night of Feb 14th/15th, a wave swept across the deck of the Toby Wallace taking with it Michael Johnson. The force of the wave was sufficient to break Michael's safety line. Despite strenuous efforts by the crew contact was lost and never re-established. Working with Portuguese coastguard coordination, UK HM coastguard requested any shipping in the area to aid a search for Michael, aircraft also joined in but after working throughout the following day and into the evening the search was abandoned. The remaining 7 crew members have transfered to one of the search vessels and will be dropped of at their next port of call.